Following the Stock Market Crash of 1929, Ray City and Berrien County residents looked to agriculture as their economic lifeline . Then, as today, the area economy was primarily driven by agriculture. During the Great Depression, agriculture and particularly tobacco production were even more critical in providing jobs for Berrien county. Tobacco of very fine quality is grown in any portion of the State, where proper attention is given to it, but it is not extensively cultivated for market, though many farms produce a home supply. In 1890 the land devoted to tobacco cultivation in Georgia still amounted to only 800 acres, which produced 263,752 pounds, or about 330 pounds per acre. The Milledgeville Recorder crop report for the month of June 1892 reflected the general poor condition for tobacco farmers during the drought of that year. Berrien — Weather for experiment in tobacco unfavorable. Where a stand has been secured it is doing well. About 200 acres planted in this section. The state publication Georgia: Historical and Industrial reported in 1901 that tobacco was still an experimental crop in Georgia. Tobacco has never been a staple crop of Georgia. Yet it can be grown with great success. Many farmers have cultivated it for their own use, and some have made a good profit by its cultivation and sale. Improved facilities for harvesting, curing and marketing it will greatly increase its production. The type of tobacco depends upon climate and soil. Rich lands give one type of tobacco, while other lands, almost useless for cereal crops, yield a tobacco very valuable for color and flavor. Of course the culture and curing of the plant have great influence on the quality. The plant is first raised in seed beds and when large enough transplanted like cabbage and tomato plants. The land used for the crop must be well plowed and harrowed. Before setting out the plants, the land must be marked three feet or more apart each way, and hills or ridges must be made at the intersection of the marks, and in these intersections the plants are set out as soon as warm weather is assured. A German farmer in Dodge county who tried tobacco-raising reported that he raised on one-twentieth of an acre 160 pounds of Sumatra leaf tobacco. He was offered $80.00 for the crop, which would be at the rate of $1,600 to the acre. In Decatur county, about eight miles from Bainbridge, is a tobacco farm of 600 acres, which yields the famous Sumatra tobacco of the finest grade. 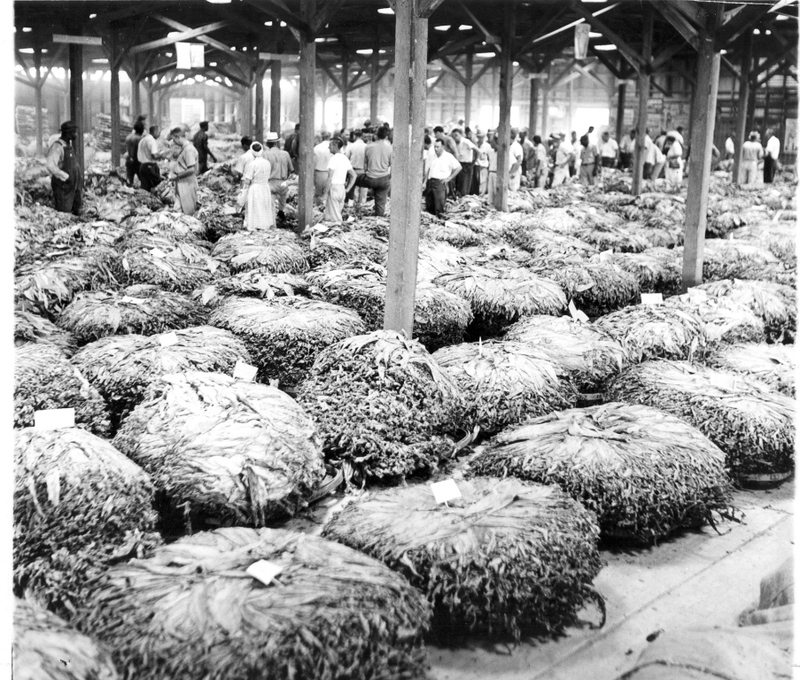 Tobacco emerged as an economically significant Georgia crop in the early 1900s. This was partly due to the arrival of the boll weevil in 1915 and the subsequent decimation of cotton cultivation. With the decline in the profitability of cotton, Georgia farmers turned to tobacco as a cash crop. Valdosta Sells 135, 000 Pounds. Valdosta Ga., August 18. – A total of 135,000 pounds of tobacco was sold on the local market today bringing an average price of slightly over 23 cents. W.M. Creech, a grower living near Ray City, sold several lots of quality tobacco aggregating about 10,000 pounds. Prices ranged from 30 cents to 40 cents per pound, averaging about 33 cents and netting him a little less than $3,000. By 1929 Georgia was producing almost 87 million pounds of Bright tobacco a year. To a large extent, life in Berrien county was centered around tobacco farming and agriculture in general. The opening of the tobacco market, the ginning of the cotton crop, truck farming, lumber milling, and production of naval stores were important annual events that bought employment to local men and out-of-town cash to the local economy. NASHVILLE, Ga., July 15. -(AP) With the opening of the Nashville tobacco market set for Tuesday, August 1, local business and general activities have taken on new life. Hundreds of thousands of dollars will be paid to growers, who likewise will part with it to local businesses. Nashville again will operate three large warehouses with two sets of buyers sent here from the most important companies. Besides regular buyers, a large group of independents are expected on the market, as indications point to an improvement in this year’s weed prices. All Nashville warehousemen have arrived on the scene to canvas the territory and assist growers in preparing their crop for market. The weed crop in Berrien county is extremely fine this year, warehousemen terming it the best in the past several years. Growers are about half through curing the crop, which is expected to be completed shortly following the market opening. Berrien county’s crop is almost three times as large as last season and by far better in quality than in 1932. Nashville, one of the larger markets of the state and centrally located, expects to market around 8,000,000 pounds of the golden weed. It is estimated that the south Georgia tobacco crop will place on the floors between 55,000,000 and 60,000,000 pounds. The opening of the season will mean that many men who have been out of employment will secure jobs. These workers are usually paid from $1.50 to $2.50 a day. Hundreds will be used on the floors for handling the weed and others in offices. Following the tobacco season the cotton crop will be a source of further revenue. Gins here and at Ray City and Alapaha are now preparing for the season and expect long and profitable runs. A 25,000-feet per day capacity sawmill is being constructed at Weber, on the Georgia & Florida railroad five miles from Nashville. Approximately 60 men will be used on the job and paid good wages. It will require five years to saw the tract. The T.J. Lowe’s Son & Co. planing mill is now operating on full time with about 25 men employed. This firm has been running on part time for the past six months, but improvement in local building and trade warranted a longer schedule of operation. The watermelon crop this season brought growers some needed money , as well as the bean and cantaloupe crops in the Enigma and Alapaha sections of the county. Naval stores operators in this county have taken on new life, due to improvement in the turpentine spirits and rosin prices.